IN consideration of the possible union of the A. M. E. Church and the A. M. E. Zion Church*-committees having been appointed by the respective bodies at their late General Conferences to meet and treat with a view to the accomplishment of that much-desired result--also, being apprized of the general anxiety for such a union, both among the ministry and laity of the two denominations, and believing that the consummation is only a question of the near future, is my only apology for dedicating this little work to the BISHOPS AND MINISTRY of these two leading branches of AFRICAN METHODISM. Should they find anything in the same that will enable them to make their ministry more effective, I shall be grateful to the GIVER OF ALL GOOD. This little work is by no means what I intended to make it, but if I find this to be profitable, I shall, the Lord willing, enlarge and amplify it, and at the same time treat other phases of our common Methodism not reached in the present writings. * The reason the organization and government of the A. M. E. Z. Church is not treated and quoted more largely in this book, is because we were told that that Church had nothing in print bearing upon it. Since, however, we learn Bishop Moore had written such a work some years ago. Sorry we did not know of it; if we can procure it, we hope to supplement this book with the organization and mode of operation of our sister church in the near future. 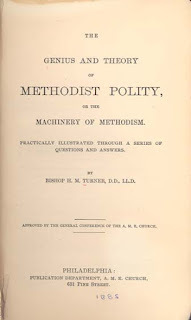 Methodist Polity, having been unanimously adopted by the General Conference of the A. M. E. Church, in its session of May, 1888, on motion of Rev. John T. Jenifer, D.D., and made a guide book for the ministry and laity in said church, and given the sanction of authority by the same, it is just and proper that I should say that the first and second chapters were written in their entirety since the General Conference adopted the book. The author is, therefore, wholly responsible for the contents of these two chapters. The other modifications and enlargements, which were made at the time of revision, were indicated in the first edition, and present no new aspects except what may appear so in their amplifications. Thus the contents are the same except the first and second chapters. THE following pages are intended to supply a want long felt among the neophyte ministry and laity of our church. Even college training seldom, if ever, fits young men for practical work in the Methodist ministry. There is a qualification that comes only through years of experience--an ordeal of toil and hard labor which is indispensable to an effective ministry; and a ministry that is void of effectiveness is worthless to God and man. The young minister, therefore, who allows himself to be flattered into the idea that he is fitted for the pastorate because he happens to understand a little about the rules of college classicality, is laboring under a lamentable mistake, a mistake he may discover too late to remedy; the sooner, therefore, he rids himself of it the better for him and the people he may serve. This small work, which has been written at intervals, or at spare times, will be found wanting occasionally in both connection and symmetry; repetitions of questions and answers will doubtless be found. But I am sure the reader will be charitable when he discovers them, in consideration of the fact that the book has been written while thousands of other duties engaged attention, and my travels were incessant. No one, therefore, could expect a regular line of thought pursued. The repetitions, however, in some instances, may serve to make the subject treated more transparent. I have endeavored also to avoid all technical terms and to use the simplest language, so that the laymen as well as the uneducated ministry could understand. 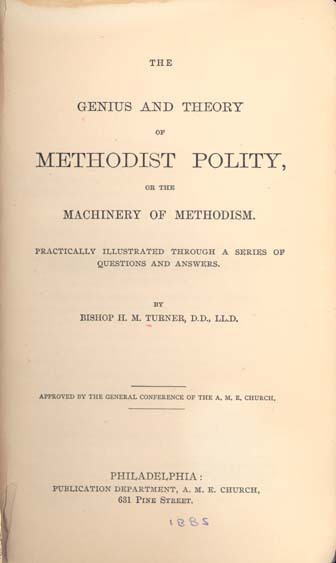 In the preparation of this work I am greatly indebted to the voluminous works of Bishop McTyeire, Bishop Wayman, Bishop Baker, Bishop Simpson, Bishop Payne, Bishop Tanner, Dr. Whitehead's Life of Wesley, Life and Times of Bishop McKendree, Watson's Life of Wesley, Watson's Institutes and Dictionary of the Bible, Buck's Theological Dictionary, Appleton's Cyclopedia, Encyclopedia Britannica, Porter's Helps to Official Members, Haddan and Stubbs' Church History, Cutts' Turning Points in History, Clarke's Commentaries, Stevens' Church Polity, Mosheim's Church History, Waddington's Church History, Canon Wordsworth's Elements of the Church, Summers' Systematic Divinity, Southwell's What is the Church? Randall's Churchman, Eusebius' Ecclesiastical History, Gibbon's History of Rome, Hore's Eighteen Centuries of the Church, Dean Stanley's Christian Institution, Jahn's Biblical Archæology, Judge Henry and Bishop Harris' Ecclesiastical Law, Burton's Ecclesiastical History, Horne's Introduction to the Study of the Scriptures, Sherman's History of the Discipline, Smith's Bible Dictionary, Neander's Life of Christ, Disciplines of the A. M. E. Church, A. M. E. Z. Church, M. E. Church South, M. E. Church, General Conference Minutes and other minor works which I cannot recall at present. While many things in this small work may appear novel and somewhat odd to those who have not studied Methodism--for too few of our preachers have, and few of them would be willing to be tested by an examination--I am sure they will find nothing that conflicts with it in word or spirit. All I have endeavored to do in these pages was to bring out and set before the preachers and people the soul of operative Methodism, that fact which is far more important than the mere body. Methodism is as much a creature of a soul as its members, and till we reach its soul it can never reach our souls. I have also tried to define the duties of each functionary in the church, from the most subordinate to the most exalted; and to set forth the rights of our lay members, and to show that they are more than creatures of mere ministerial whims, to be kicked out of the church at pleasure, without charges, specifications, trials, time to prepare, and many other prerequisites to which no attention is frequently given. Few people are aware that it takes ten times the labor to turn a person out of the church it does to get him into it; that members have vested rights which cannot be trampled upon with impunity. Scores of ministers also have but little definite knowledge of the prerogatives that inhere in their respective positions; but if they will study this little work, I believe they will be prepared to comprehend them more clearly and discharge them more fully.